I interviewed Happy Days icon Henry Winkler for The Guardian a couple of days ago on the happy occasion of his being made an honorary OBE (Officer of the Order of the British Empire) by Her Majesty the Queen. As we chat in his fancily cozy living room, I smell amber in the air, then clock the three L'Artisan Parfumeur terracotta amber balls on the coffee table between us. My fume radar is up and activated. “Do you wear fragrance?” I can't resist asking. Henry obligingly leans forward in his armchair, offering his neck for me to sniff. I catch a whiff of spices and flinty vetiver. YSL Pour Homme is a 70s classic: a lemon-o-centric animalic aromatic number that's both zesty and earthy. Perfect for The Fonz! Officer of the Order of the British Empire? Terre d'Hermes-lover? 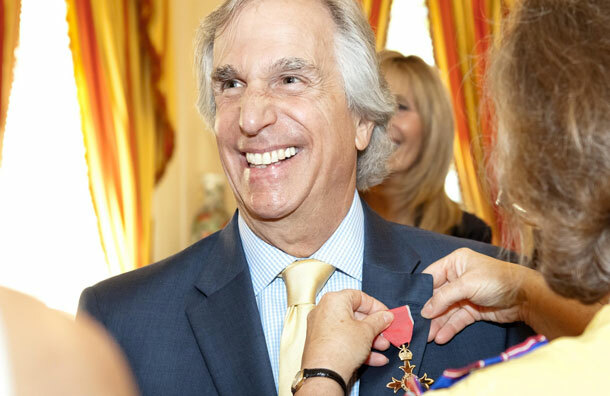 Henry Winkler, we hardly knew ye. Look forward to reading this, Katie. You chatted with Winkler! About perfume! What a thrill! Thanks for sharing this fragrant moment - a treat for us Fonz fans. TdH seems perfect for him! Ticks every box, it's by far the most reliable fragrance In my wardrobe. This is terrific! Love that you shared. I couldn't wait to spill the warm'n'wonderful Mr. Winkler's fragrance secrets. I love the odd intersection of pop culture and perfume. Terre d'Hermes is indeed a worthy choice. Any insights into what he used to use to slick back the trademark quiff? Silly me, I know the answer to that already - it is simply called "product" - or at least it is when my hairdresser whacks some on. Vanessa, we didn't move from personal scents to hair product as time was limited, but he was such a forthcoming charmer, I'm sure I can pick up where we left off if ever we meet again. I absolutely love those L'Artisan wooden amber balls and have 2 in my house. I wish they made an equivalent fragrance. Catherine, isn't the equivalent L'Artisan's L'Eau d'Ambre perfume? Haven't done a side by side, but always thought they worked the same turf. Henry Winkler - sure, YSL. 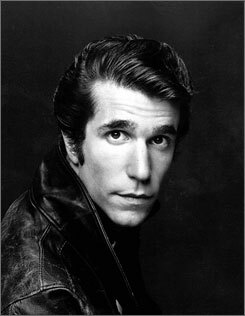 but THE FONZ? The Fonz wears Yatagan. I have spoken. Arizer, doesn't that scene fill you with joy? Been wearing Terre d'Hermes myself for several years. Started as a gift from some Dubai Hedge Fund investors, and I love it. Some get started on a favorite fragrance as a gift from Grandma, others as a gift from hedge fund investors. Funny! I've always wanted to know what fragrance the Fonz would wear and now I know..! thanks sharing for nice video of fragrance. i know also about fonz wear. Catherine, I was thinking of you when I was in Paris last month smelling L'Artisan's amber balls and their L'Eau d'Ambre, and they are indeed the same smell.